Chigo means small children and gyohretsu means a procession. in order to wish the healthy growth and happiness of small children. that they are messengers of gods in some areas. 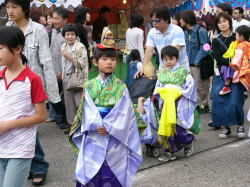 After the procession, children get "Suzuharai"